After devoting so much of his recent years to fighting for the LGBTQ community, the attack on Pulse, a gay nightclub in Orlando, hit Jim Obergefell especially hard. Nearly one full year after celebrating a huge LGBTQ victory as the lead plaintiff in Obergefell v. Hodges, the Supreme Court case that ensured marriage equality was a constitutionally protected right, Obergefell watched the worst mass shooting in U.S. history target an LGBTQ hotspot. "Devastating," Obergefell says when I ask what it was like learning about Orlando. "I mean... like my heart was ripped out of my chest." For Obergefell, Orlando was a watershed moment in his life in one of the worst ways. "What I realized that day, hours after the news started rolling out, it was the first time in my life that I felt afraid for my life," he says. Obergefell explains that, relative to what other members of the LGBTQ community face, he and his husband, John Arthur, had been "really lucky" because "our families were great [in the way] they treated us from the moment we were a couple, the reaction every LGBTQ kid hopes for." Granted, Obergefell knows anti-LGBTQ discrimination all too well. He became one of the major faces of marriage equality advocacy because his and Arthur's home state of Ohio wouldn't recognize their marriage (which took place in Maryland). That desire to be legally recognized as a married couple, and to be listed as Arthur's surviving spouse on his death certificate, led Obergefell to take his fight to the highest court in the land. Still, Obergefell notes that before Orlando, he didn't feel physically threatened or scared. "Even though John and I lived in Cincinnati, which was such a gay unfriendly city, we never — and maybe we’re just blind to it, maybe we chose not to see it — but we never [felt like] targets of discrimination. 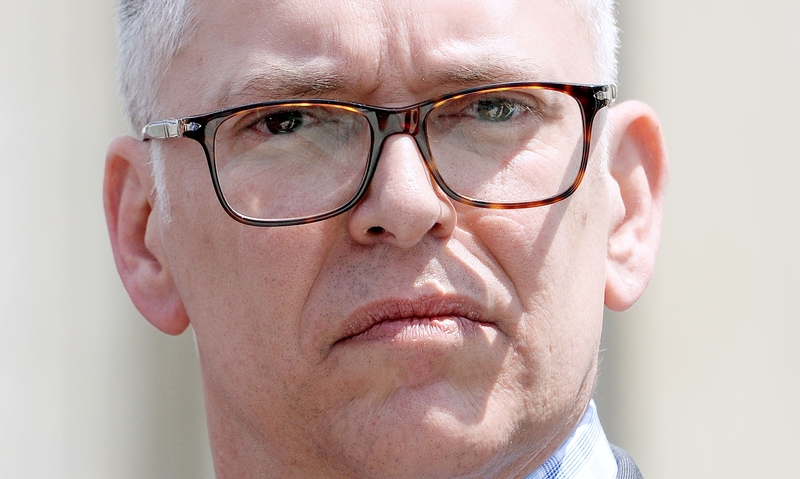 I don’t remember ever being called 'f****t' walking down the street," Obergefell says. "I don’t remember any of those things that unfortunately many people do." However, Obergefell says that all changed when the Orlando shooting happened, claiming 49 victims. After the attack, Obergefell says he became more aware of what so many members of the LGBTQ community, especially transgender people, live with regularly. "What really struck me was the fact that I'm feeling this for the first time, and our transgender siblings live that every single day," Obergefell tells me. "And that really made it [Orlando] more heartbreaking to me, to really understand what they live with and the fear they must live under." "Orlando was just such a horrible hate crime, and there’s so much, so many of these across the nation," Obergefell says. "So many people have contributed to creating an environment in our country where violence against us, intimidation against us, is not only condoned, but encouraged. And, unfortunately, this hate crime was such a visible example of it, and it's just heartbreaking." Obergefell happened to be starting the tour for his new book, Love Wins (co-authored by Debbie Cenziper) the day of the Orlando attack, which he says was a blessing in its own way. "There was some comfort in being in groups of people who were part of our community and allies, talking about how love does win and love can change the world," he tells me. "So for me, it was an even more meaningful experience to talk about the message of our book at that time." Since the horrific attack occurred, Obergefell has devoted time to raising awareness for the GoFundMe fundraisers and blood drives for the Orlando victims, showing his activism isn't limited to marriage equality.